The Song of the Year songwriting contest has awarded Amy Hindman the Runner Up placement in the song contest. Song of the Year receives entries from all over the world and only the top songwriters receive a Semi-Finalist placement in the songwriting competition. The Song of the Year songwriting contest has awarded Amy Hindman the Semi-Finalist placement in the song contest. Song of the Year receives entries from all over the world and only the top songwriters receive a Semi-Finalist placement in the songwriting competition. The Song of the Year songwriting contest has awarded Amy Hindman the Runner Up placement in the song contest. Song of the Year receives entries from all over the world and only the top songwriters receive a Runner Up placement in the songwriting competition. ​The Song of the Year songwriting contest has awarded Amy Hindman the Semi-Finalist placement in the song contest. Song of the Year receives entries from all over the world and only the top songwriters receive a Semi-Finalist placement in the songwriting competition. The Song of the Year songwriting contest has awarded Amy Hindman the Honorable Mention placement in the song contest. 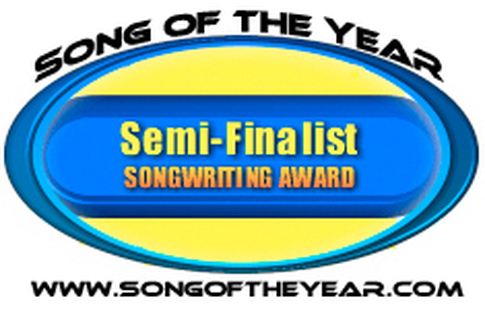 Song of the Year receives entries from all over the world and only the top songwriters receive an Honorable Mention placement in the songwriting competition. contains four of Amy's songs winning top awards! "Gandhi and King: Becoming the Dream"
"Seattle Blues / Island Hues"
When she released her 1st Album, back in 1992, she received a phone call from Dorothy Ives, who had been given her recording by Laura Burton, of Burton Jewelers in Anacortes, inviting her to sing with the infamous Burl Ives. Dorothy said “Your voice is beautiful! Would you like to sing with Burl?” Dorothy did not know that the invitation came on Amy’s 40th birthday, while living in her log cabin on Guemes Island, her home for 6 years. College in 1993, with an audience of 2000 people, a Benefit for the Skagit Enhancement Foundation, and Amy sang a solo for each concert, one of the songs being “Puget Symphony”. Randy Sparks, who started the “The New Christy Minstrels”, was part of the concert, and the MC was Angie Dickinson, who introduced Amy to the audience. In 1966, they were living in Denton, Texas, and shortly after Amy’s mother died of cancer (when she was 11), her family and new stepmother, Billie, moved to Bangkok, Thailand for 3 years. Amy is the youngest of five, and has had a very “colorful” life, as she describes it: not dull at all. Her brothers and sisters are talented musicians, actors, writers, teachers and quilters?? (Amy didn’t get THAT gene, & says at 5 years of age she was playing with her grandmother’s sewing machine and proceeded to put the needle right through her thumb). She says she knew then, that sewing and homemaking wasn’t to be her area: sometimes you just know. 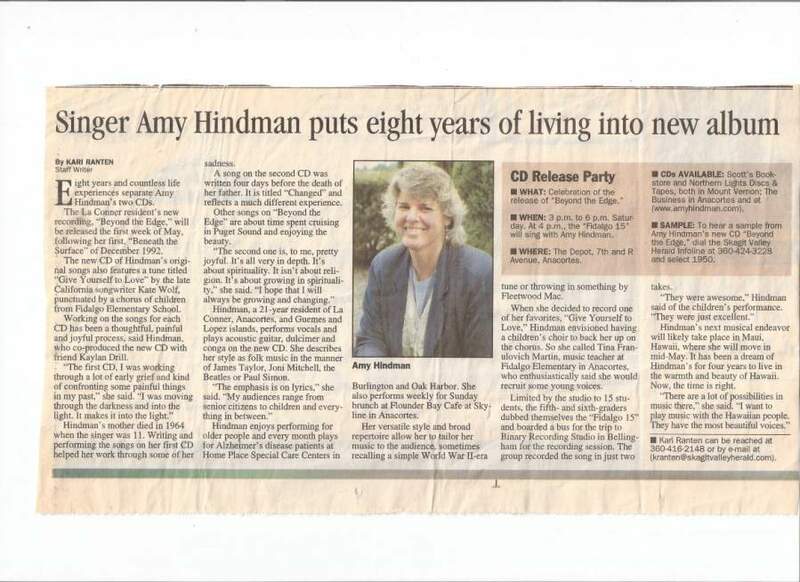 Amy’s first 2 CD’s (Beneath the Surface, 1992, and Beyond the Edge, 2000), were recorded at Binary Recording Studio in Bellingham, and the new one was recorded in her own garage studio, here in Shelter Bay, La Conner. The studio was built by local angels, Ralph Westover, Ken Kraemer, Richard Mattrass, and Lance, Amy’s neighbor. The final mixing was done with Phil Heaven at Soundings of the Planet in Bellingham. Kaylan Daane Co-Produced the album with Amy and the CD features local artists: Amy Hindman (vocals, guitar, mountain dulcimer, udu), Morty Webb (bass & vocals), Raven, (didgeridoo), Anna Schaad, (violin, viola, octave violin), Phil Heaven (viola), David Vaughns (drums), Suzi Schadle (bass flute). Other musicians, not so local, are Jonathan Brown (Amy’s nephew from Amsterdam, on ukulele and vocals), and Natalie Drill, age 6, (vocals) Kaylan’s granddaughter, of Broomfield, Colorado. Amy plans, after the CD is released, to start work immediately on her 4th CD, entitled “Moon of Listening Woman”. The songs are already written. Her future plans are to work on writing her book about her life experiences. The In My Waking Dream Album Release Party is scheduled for August 17th, 2013, Saturday from 1-4 at the Shelter Bay Clubhouse in La Conner. Live Music is at 2:00 (with some of the studio musicians). Admission is free, all are invited, and CD’s will be available at that time.